…was the name of the episodes of M*A*S*H I just finished watching. Even after all these years and all the shows on TV, I still enjoy a good episode of the 4077. It’s like some sort of soothing late night touchstone. When I was a kid I sometimes had a hard time falling asleep. It’s actually something I don’t talk about much because it really was sort of traumatic for me at the time. See I had this fear that if I didn’t fall asleep by a certain time, well, then I wouldn’t fall asleep at all. And for someone that was told so much by parents, by teachers, by Sesame Street that sleep was as important as breathing, the thought of never falling asleep can be pretty scary for a little kid. Sure, it’s an irrational fear but what isn’t when you are small. Getting sucked down the drain, creepy bug eyed monsters in the closet, and mine was the fear that I’d never fall asleep again. It was one of the gripping fears too, one that really make you just watch a clock and let you mind race until you work yourself up into a quiet little frenzy. In any case, sometimes, when I finally had as much as my little 7 year old frame would take, I’d go try and snuggle up with the nearest grown up. Being the 5th of 6 kids, this wasn’t hard in my household, as besides my Mom and Dad, I had older brothers and sisters who were 10 years my senior. Whether its my beer deadened brain so many years since just jumbling memories together or something else, what I can remember is that most of the time they were watching some sort of TV when I went looking for solace. 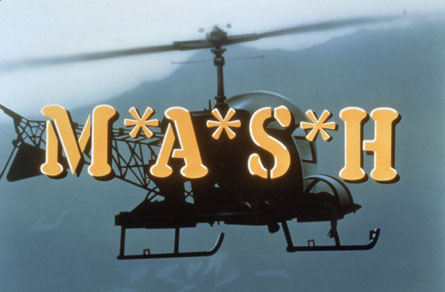 Sometimes, it was Doctor Who, or Magnum PI, but often times, it was M*A*S*H. Whether that was my parents or my older brother and sister, or even my Grandma, I just remember them watching M*A*S*H late at night. And as I would crawl up into their laps or snuggle next to them in their bed or on the couch, happy that I wasn’t alone with my crushing insomniac thoughts anymore, I can remember the sounds of M*A*S*H before I fell asleep. So to me, M*A*S*H isn’t really just a TV show. I mean it’s not even one of my favorite TV shows. It’s not really funny for being a comedy with some of the later seasons being downright preachy once Alan Alda really got his grubby hands all over it. 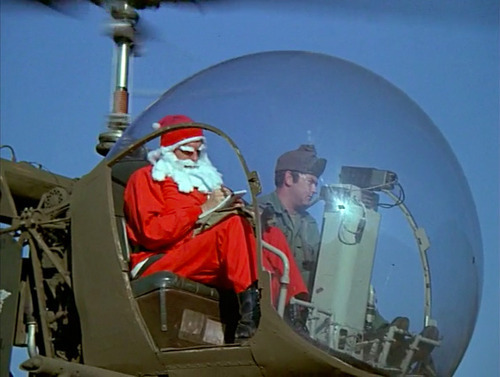 And for a show about the Korean War that only really went on for 3 physical years in real life, it seems like they had a lot of Christmas episodes, which never made any sense. But still I’ll watch M*A*S*H whether its on and not really mind. In fact, it’s sometimes just nice to have as background noise. I’m sure if you hooked me up to a EKG machine when it’s on, my heart rate probably drops and breathing becomes slow and steady. Well, maybe I wouldn’t go that far, but you get my drift. Anyways, why am I strolling you down memory lane like this? Well, in part it’s because 8/10 times I don’t really plan what I’m going to write about in my blogs and they kind of flow from whatever is on my mind at the time. But more it’s to show that I don’t feel the need to write every blog about meaningless dribble. I can write a pop culture blog that leaves you the reader with a better sense of who I am and what makes me tick. And who knows, someone out there might read this and say “I get this. Same thing happened to me.” If that happens, well, then I’ve made a connection with someone I don’t even know in real life, but in some weird cosmic kumbaya way we do “know” each other in terms of the broader perspective of being human. How’s that for blowing your collective minds? And here you thought I was just another smarky good looking hipster doufus. I just had a “very special episode” with you all. BAM! In any case, in closing for today, I did want to share one geeky thing with everyone out there. As some of you know, I’m a pretty avid painter of miniatures. Born out of the need to have cool little dudes for my D&D group, I found the hobby very relaxing yet challenging. I’m also a pretty avid fan of the old Masters of the Universe toy line, so I thought there had to be way to Reese’s Peanut Butter Cup this together into one sort of super hobby. The problem is despite being one of the most lucrative toy lines in history (at it’s high point, MOTU was like a license for Mattel to print money) Mattel has woefully mismanaged the property big time since at least 1986. So its not like they were going to make miniatures that I could buy to paint. Yes, Grenadier made some back in the early 80s but they are so rare that it’s way too expensive to make a reality. So necessity being the mother of invention, I went looking through all the miniature companies out there for ones I could mod into MOTU miniatures. Luckily, I found some really nice ones at Reaper that I could trick out, and well…it’s time to start sharing pictures. So over the course of the next couple weeks I’m going to post a picture here and there of my work. Again these are all hand painted and ARE NOT MOTU licensed. If they look like MOTU characters, it’s because of hard work and time to find suitable ones. First up, is my Beast Man. 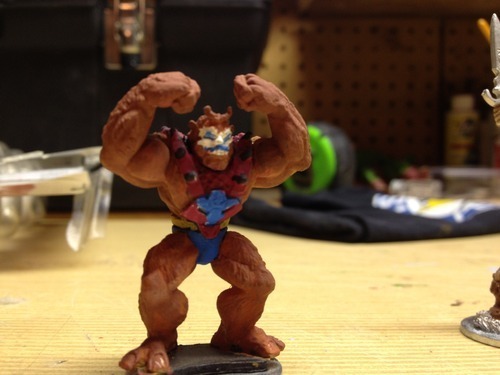 I made him out of a Ulik Troll from the Thor line of the popular Heroclix line. I’m particularly proud of the face as it took me a while to get the detail right. I’m interested in hearing what people have to say so drop me a line with comments if you got ‘um.